For as long as anyone can remember, the basic task of literary scholarship has been close reading. Sit down with a book, pencil in hand, read, pay attention — and then tell the world what you noticed. Franco Moretti, however, often doesn’t read the books he studies. Instead, he analyzes them as data. Working with a small group of graduate students, the Stanford University English professor has fed thousands of digitized texts into databases and then mined the accumulated information for new answers to new questions. How far, on average, do characters in 19th-century English novels walk over the course of a book? How frequently are new genres of popular fiction invented? How many words does the average novel’s protagonist speak? By posing these and other questions, Moretti has become the unofficial leader of a new, more quantitative kind of literary study. To many readers — and to some of Moretti’s fellow academics — the very notion of quantitative literary studies can seem like an offense to that which made literature worth studying in the first place: its meaning and beauty. For Moretti, however, moving literary scholarship beyond reading is the key to producing new knowledge about old texts — even ones we’ve been studying for centuries. Most recently Moretti has turned his attention to what might be the most familiar text in English literature: “Hamlet.” Using the play as a kind of test case, Moretti diagrammed and quantified the plot, charting the relationships among characters as a network based strictly on whether they speak to one another at any point in the play. He published the results in an article, “Network Theory, Plot Analysis,” in the March/April 2011 issue of the New Left Review. Seen through Moretti’s network diagrams, “Hamlet” often seems brand new. One notices, for example, that of all the characters who speak to both Hamlet and Claudius, only two manage to survive the play (Moretti calls this part of the network the “region of death”). Or one notices that Rosencrantz and Guildenstern, the most famous pair of minor characters in all of Shakespeare, never speak to each other. Although network analysis is still finding its legs, Moretti’s larger ambition for it is clear: It represents a way out of the reader’s limited perspective, or at least an acknowledgement that those limits exist. Moretti spoke to ideas from his home near Stanford. IDEAS: What are the most basic differences between traditional literary scholarship and what you do? MORETTI: Traditional literary analysis takes as its object the single text, whereas here one looks at thousands of texts at once. We’re studying a different object...an archive of a thousand novels is not a message that was sent to readers by a novelist. One hundred thousand novels don’t have a message for the reader, so you don’t have to listen. Instead, you have to ask questions. And we’re not so good at asking questions yet. IDEAS: Do you think literary studies is in decline? MORETTI: This happens to disciplines. Theology used to be the center of the university, and now it just barely survives. I think literature is going through something similar, and the reason is kind of simple: Universities have started studying film, TV, the Internet, video games, and so on. There are competitors that, half a century ago, were not there....The time has come for some new projects to be taken seriously. IDEAS: Other scholars have been trying to do quantitative literary analysis, in fits and starts, for decades. Will your effort be more lasting? MORETTI: We have new archives, databases. We have entire libraries in searchable form, and this is something that did not exist before. And we have new tools that can do things that would take armies of human beings to do. IDEAS: Did you use any software or algorithms to produce the diagrams that appear in your “Hamlet” article? MORETTI: I re-read the whole play and simply marked down who was talking to whom, scene after scene. Slowly, the network took shape. Now of course that can and should be done by a computer...but I wanted to have a sense — almost a direct sense — of the network slowly taking shape. IDEAS: What did you learn about “Hamlet” as you watched this network take shape? MORETTI: One thing is the discovery of how central Horatio is to the play. And that is interesting in itself, because Horatio is usually not one of the characters on whom people focus. He’s a very bland character, and he usually speaks very blandly....Usually we think of central characters as important in every possible way, but this is not the case here. MORETTI: We have to re-think our idea of character altogether. It disproves our thinking about characters in binary terms: i.e., they’re either a protagonist or a minor character. They’re either round or flat. Now there seem to be more positions along this continuum. IDEAS: What kind of insights could you see network analysis producing on a larger scale? MORETTI: Literary critics tend to think in terms of all or nothing. “This is interesting or not.” “This is right or wrong.” But in fact what you learn is that there is such a thing as being partially right. And this seems common sense, because in everyday life we know what that means, but in a field that is used to thinking differently, it is perhaps the hardest thing to recognize: that while you may have found something, you have not found everything. Or that when you realize that you have not found everything, that doesn’t mean you have found nothing. IDEAS: Have you encountered resistance to your work from other scholars? MORETTI: I don’t want to exaggerate this...I’m not a guy who has encountered very much resistance. But objections take two forms. Form one is: This method is useless, but because you are a good literary critic you can find results, even though the method is wrong. I think this objection is...whatever. The other objection is: OK, so you found these things. So what? What does that change? I take this objection seriously. As I said, new methods need a little time to find their way, but we should have an answer to the “so what” question in a matter of a few years. Not tomorrow, but not 20 years from now, either. IDEAS: Has this kind of work changed your views on reading? Do you read differently now? MORETTI: No. When I read, I still read in the same way. It’s just that when I write about literature and think about it, I think differently. Franco Moretti the reader has remained the same, but the distance between Franco Moretti the reader and Franco Moretti the scholar — that has increased. 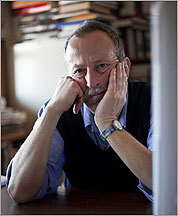 Richard Beck is a writer living in New York City.